In the course of an impressive career spanning half a century, George Evans has established himself as one of the comics field’s finest illustrative talents. During that time span, Evans has worked for almost every major publisher in the industry, which includes an impressive tenure at E.C. Comics. Many feel that Evans, an airplane buff, created the best aviation stories in comics, a claim amply proven by the stories and covers he provided for the last of the great aviation titles, Aces High. George Evans was born in Harwood, Pennsylvania, on February 5, 1920. His lifelong interest in aviation began when he was nine years old and had stumbled across an issue of a pulp called Sky Birds. The magazine belonged to a friend’s uncle, who struck a bargain with the young Evans: all he had to do to get the magazine was to go out on the streets and scrounge around for discarded cigarette butts. When he had collected enough to fill a can and had stripped them for the tobacco, Sky Birds would be his (this was during the Depression). While his friend’s uncle was hooked on nicotine, Evans was now hooked on aviation pulps. When he was 15 he had his first drawing (and poem) published in another pulp, Daredevil Aces, and went on to sell more art to other pulps as well. When World War II broke out, Evans tried to join the Air Force but was turned down due to less than 20-20 vision. He wound up as an aircraft mechanic at Shaw Field in South Carolina, where he was often able fly in those planes he had worked on (which must’ve been a terrific incentive for good work!). After studying art at the Scranton Art School, Evans entered the Army. After the war, and with the pulp magazine field withering on the vine, Evans sought work in the comics field, landing a staff artist position at Fiction House, publisher of pulps and a comic line that included Wings Comics, Jungle Comics, Fight Comics, and -most popular of all with collectors-Planet Comics (the first issue is valued at $9,000 in the 1999 Overstreet Price Guide). Evans drew several minor features in Air Heroes, as well as writing text for filler articles. In 1949 the Fiction House job abruptly evaporated -the in-house staff had a reputation of being a zany, fun-loving bunch and evidently management felt they were too fun loving. The staff was laid off and the company then relied solely on free-lance talent. Evans had met the teenage Frank Frazetta while at Fiction House and had become friends with another young artist, Al (Star Wars) Williamson, who advised him to look for employment at Fawcett (Captain Marvel Adventures, Whiz Comics). Evans busied himself drawing various features, including two science fiction titles, the adaptations of the film When Worlds Collide and TV’s Captain Video (the latter now worth $800.). Evans liked working at Fawcett and might’ve settled in for a long stay but was undone by external circumstances: Fawcett, dismayed by low sales and high paper costs, as well as a wearing legal battle with National over supposed copyright infringement, decided to drop its comics line and concentrate on magazines and paperbacks. By 1953 Evans was again looking for new work. Thanks to another tip from Williamson, Evans sought work at Entertaining Comics (“They had, I guess, the best people on staff because they were paying a few dollars more per page than other companies and they had good stories to work on.”) As E.C.’s Al Feldstein liked to work for his artists’ strengths, Evans’ first assigned story, “Roped In,” (Tales from the Crypt #32) was an aviation tale of sorts: three unscrupulous businessmen, having trapped an innocent associate in a frame-up, are themselves trapped when their four-seater airplane is caught in a gigantic spider’s web. 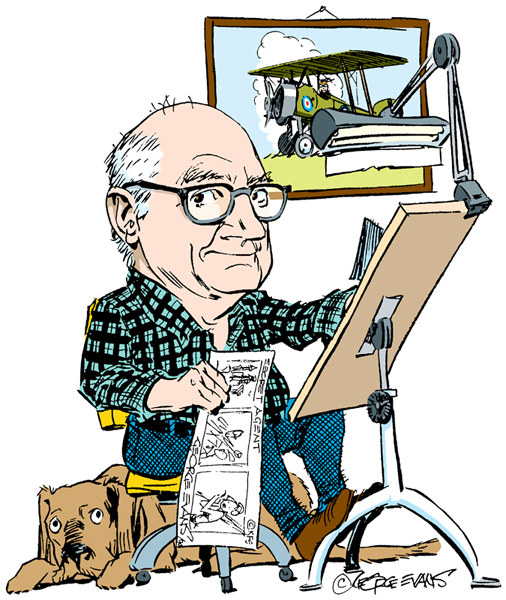 Evans also turned in some fine stories for Frontline Combat and Two-Fisted Tales, all aviation yarns, but was unhappy with editor Harvey Kurtzman’s practice of laying out each and every panel to an exacting degree, a policy Evans found restrictive. Gaines’ next move was a new line, his “New Direction” comics. One of them, Aces High, featured stories of aerial combat in the days when men still fought in fabric and wood craft like Fokkers and Spads. Although the stories were more fiction than fact, Evans was in his element and, as might be expected, was the real star of the title that included fine work by Jack Davis, Bernie Krigstein and Wally Wood, doing the lead story and cover (which he colored himself) for each issue. 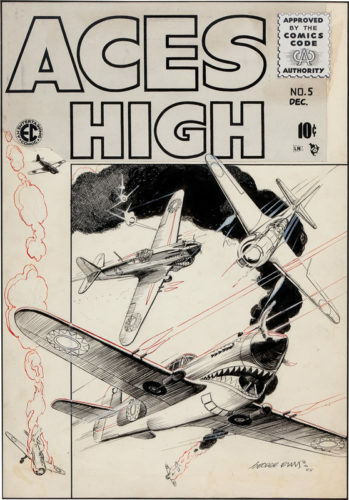 The comic seemed made for a man of George Evans’ talents and interests but, unfortunately, the New Direction for Aces High and such titles as Impact, M.D., Piracy, Extra and Valor, seemed to be down, and none of them would last beyond 1956. With E.C. 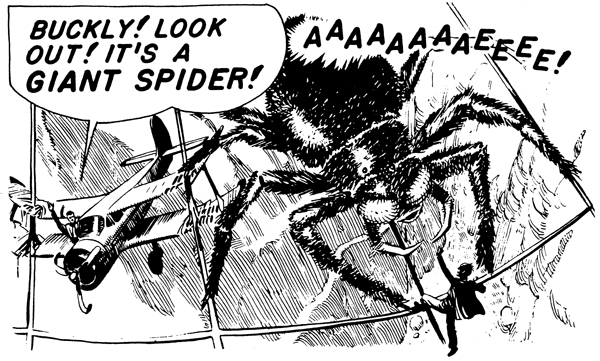 gone, Evans began drawing for Classics Illustrated, which was a haven of sorts for some E.C. artists like Joe Orlando, Graham Ingels and Reed Crandall (and rather a bonus for Classics Illustrated, which usually featured pedestrian artwork). Evans illustrated comic book adaptations of Joseph Conrad’s Lord Jim, Shakespeare’s Romeo and Juliet, Alexandre Dumas’ The Three Musketeers and other major literary works until 1962 (Classics Illustrated itself would only last until April 1971). Some time later Evans got a better reception from another DC editor, Murray Boltinoff, and turned out a steady stream of stories for DC’s war and supernatural titles. In the late 60s he made his first excursion into the syndicated comics world by working as the artist for George Wundar’s Terry and the Pirates dailies (another aviation strip!). Wunder would pencil in the heads and indicate with notes as to whatever else was happening (“office,” “airport,” “riot scene”) in each panel. Eventually Evans took on the inking chores as well, working on the job until 1972. During the 70s Evans would continue working for DC, supplementing his freelancing with jobs at the high-paying National Lampoon (“and other accounts galore”). In 1980 Al Williamson had tired of working on his Secret Agent Corrigan (originally Secret Agent X-9) and asked George to step in. Evans first daily hit newspapers on February 4, 1980 and he carried on with Corrigan until choosing to retire from the strip in 1996. George Evans still continued to work on occasional jobs in a shrinking field now dominated by the super hero genre; despite the high caliber of his work, there seemed little call for his style – which was ultimately the comics field’s loss. In his last years Evans relaxed with his hobby, participating in The Pulp Era Amateur Press Society with “A Pulp Addict’s Ramblings”, which was devoted to (what else?) aviation pulp magazines! After a brief illness, the artist died asleep in his home on June 22, 2001. He was 81. As a fan of George Evans’ work I was eventually able to send him the piece and Mr. Evans was kind enough to supply me with the corrections to some howling bloopers while mercifully refraining from cutting me off at the knees! I’m glad to have the opportunity to present the amended biography here on Jim Keefe’s site. For more on George Evans check out the following links. And here’s a news segment from 1990 covering a comic book convention in Greensboro, North Carolina featuring legendary artists George Evans, Al Williamson and Dave Stevens. And last but not least, I’m not the only one blogging about George Evans. Here’s just a sampling – enjoy! This entry was posted in Artist Spotlight, George Evans and tagged George Evans, Steve Stiles. Bookmark the permalink.